PEC Engineers will be attending the 2019 Structures Congress in Orlando, FL from April 24 – 27, 2019. Our engineers will be active during the entire event, participating in committee meetings and presenting interesting topics related to the blast performance of steel frame systems and using progressive collapse methods for seismic evaluation of structures, alternative load path analysis (ALPA) guidelines, the new Disproportionate Collapse design standard, and our authorship of the newly published FHWA Bridge Security Design Manual. David Stevens will be attending the Disproportionate Collapse committee meetings where he will lead discussions on the soon-to-be-released Alternative Load Path Analysis (ALPA) Guidelines and on Chapter 5 Design and Analysis Procedures for the quickly approaching Disproportionate Collapse Design Standard. Dr. Stevens will also be moderating a technical session on the ALPA Guidelines. Eric Sammarco will be attending the Blast, Shock, and Impact committee meeting to discuss his updates to the ASCE Structural Design for Physical Security text, and he’ll also be attending the Bridge and Tunnel Security committee meeting to continue pushing forward the state-of-practice in transportation infrastructure security and resiliency. As a primary author of the new FHWA Bridge Security Design Manual, Eric will also be presenting an overview of the new design manual and how it can be applied to both existing and new highway bridges during a technical session on Friday (4/26) morning. 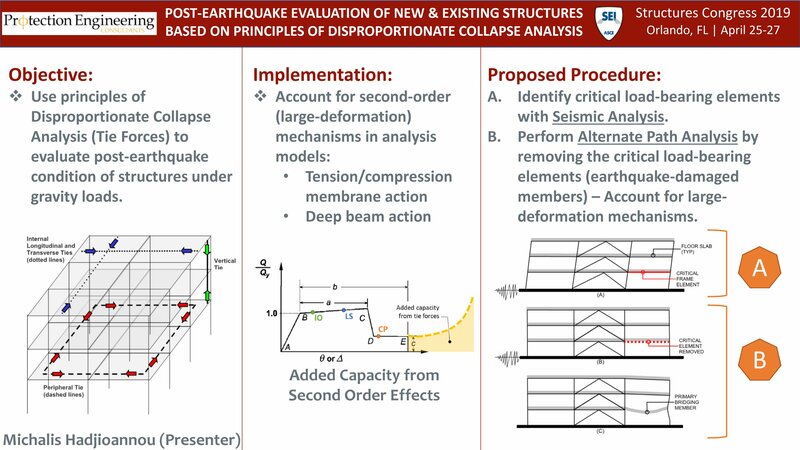 Michalis Hadjioannou As part of the Innovative Executive Sessions (IES), Michalis will be presenting on Post-Earthquake Evaluation of New and Existing Structures Based on Principles of Disproportionate Collapse Analysis. Click here to see the slide. Aldo McKay will be attending the ASCE 59 committee meetings and will also be participating of the IES. 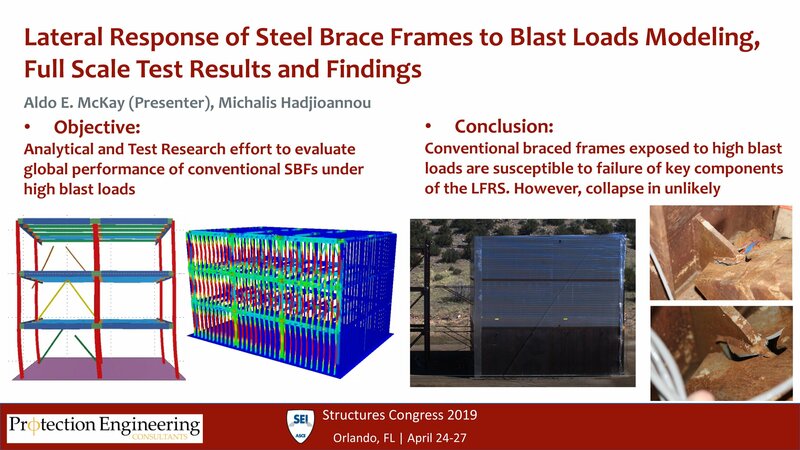 His presentation will discuss results from a full-scale test to evaluate the performance of steel braced frames under blast loads. Click here to see the slide.